32 SMT007 MAGAZINE I NOVEMBER 2018 printing for simplicity. 3D printing is a pro- cess that creates a three-dimensional object by building successive layers of raw material. Each new layer is attached to the previous one until the object is complete. Objects are pro- duced from a digital 3D file, such as a comput- er-aided design (CAD) drawing or a magnetic resonance image (MRI). The flexibility of 3D printing allows designers to make changes eas- ily without the need to set up additional equip- ment or tools. It also enables manufacturers to create devices matched to a patient's anatomy (patient-specific devices) or devices with very complex internal structures. These capabilities have sparked huge interest in the 3D printing of medical devices and other products, includ- ing food, household items, and automotive parts." 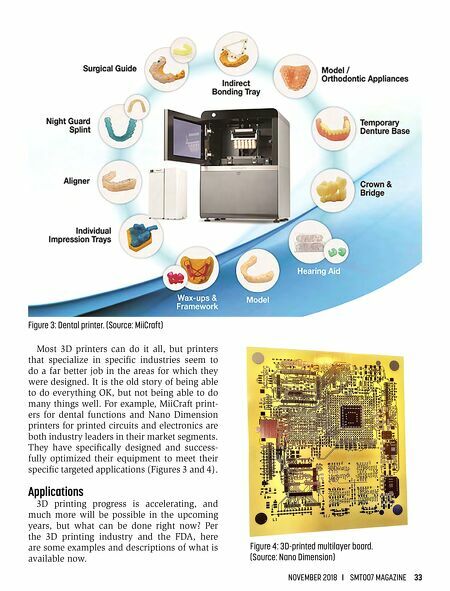 As those of you who have followed our cov- erage of disruptive technologies know, 3D additive technology has transformed many industry segments already, which includes significant changes to the medical and dental industries. 3D printing has been used to man- ufacture dentures and other oral implants for years but is also proving to be useful in other areas (Figure 1). For example, I recently chose to have a tooth replaced with an implant. In the past, it was necessary for the oral surgeon to take numerous X-rays from differing angles, combine them, and use them to measure and create the specifications for the implant fabri- cator. This time, I only had to do a single 360° 3D image that allowed the surgeon to design the perfect implant at the exact size and shape needed with CAD. The entire process took 15 minutes. It is no wonder that fast, high-quali- ty 3D scanning has replaced X-rays as the pre- ferred method of gathering the necessary data for so many areas of medicine. 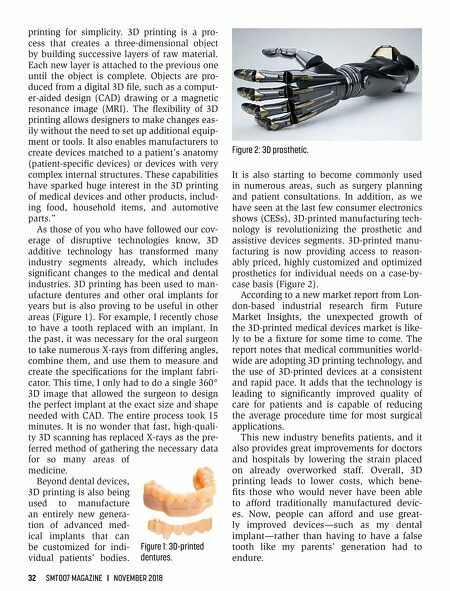 Beyond dental devices, 3D printing is also being used to manufacture an entirely new genera- tion of advanced med- ical implants that can be customized for indi- vidual patients' bodies. It is also starting to become commonly used in numerous areas, such as surgery planning and patient consultations. In addition, as we have seen at the last few consumer electronics shows (CESs), 3D-printed manufacturing tech- nology is revolutionizing the prosthetic and assistive devices segments. 3D-printed manu- facturing is now providing access to reason- ably priced, highly customized and optimized prosthetics for individual needs on a case-by- case basis (Figure 2). According to a new market report from Lon- don-based industrial research firm Future Market Insights, the unexpected growth of the 3D-printed medical devices market is like- ly to be a fixture for some time to come. The report notes that medical communities world- wide are adopting 3D printing technology, and the use of 3D-printed devices at a consistent and rapid pace. It adds that the technology is leading to significantly improved quality of care for patients and is capable of reducing the average procedure time for most surgical applications. This new industry benefits patients, and it also provides great improvements for doctors and hospitals by lowering the strain placed on already overworked staff. Overall, 3D printing leads to lower costs, which bene- fits those who would never have been able to afford traditionally manufactured devic- es. Now, people can afford and use great- ly improved devices—such as my dental implant—rather than having to have a false tooth like my parents' generation had to endure. Figure 1: 3D-printed dentures. Figure 2: 3D prosthetic.